Last week, I've cranked through the second-to-last class for my D.Min. program. It's one of my two electives, and has been an opportunity to get out of the churchybook-leadershippy-organizational focus of my program and back into some heavy lifting scripturally. The class itself was a deep look at Pauline literature, with a specific focus on the sociocultural dynamics of first century Greco-Roman culture. Yeah, I know, but I love that stuff. Totally floats my boat, it does, as Yoda might say. I've always found the historical context of our sacred texts deepened my sense of their reality, and knowing the culture that shapes a text really also lights up the texts in a different way. Roman culture, after all, was not exactly like our own. Understandings of what it meant to be in a household, what it meant to have honor and value in the culture, and even what it meant to be a person? All of those things were different. Knowing those differences is absolutely key to grasping the purpose of much of what Paul had to say to that gaggle of messy communities that started the whole Jesus movement. What was particularly striking the class as we progressed was just how radically countercultural Paul's teachings were in the first century. Teachings that tear down or subvert the social hierarchy might seem an easy thing to a culture that celebrates individualism, but in a rigidly structured society in which honor, shame, and rank were the primary currency, those teachings were more than just interesting. They were borderline insane. Doing for others, with no regard for yourself and your position? Nuts. But for all of the differences between first century culture and our own, what is even more striking for me has been the degree to which we homo sapiens sapiens haven't changed as creatures in the millennia since Paul wrote. Oh, we might like to think that we have. We might like to think that the dynamics of power aren't the same in our world. But power and prestige are still potent things. We still curry favor, and view our relationships with one another in terms of power dynamics and our own advantage. We still do favors with the idea that we will be the powerful patron, to whom subordinates will be grateful and loyal. Having grown up inside the Beltway, and worked in the DC area, this truth is inescapable. So as we reflected on the countercultural character of the Gospel in the first century, we also reflected on how it remains countercultural. And I, in my usual introvert-mutant way, also mused on how that radical message of love for other is not just countercultural, but somehow runs contrary to our biological nature. Because Rome and Washington may think of themselves as more complex than our primate ancestors, but really? We're not. We still align ourselves with strength. We seek the power of the group. 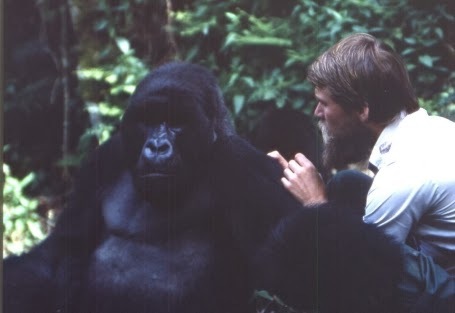 We pick nits from that silverback, knowing that he'll protect us. We align ourselves with those whose power matches our own, and together fling poo at those interlopers who are trying to mess with what is ours. And yet to we higher primates, somehow from a deeper place there has come the realization that this is not the best way of sentient life. We show kindness to show kindness, not for our own gain. We provide help not just to those of our tribe or group or family, but to those who might be viewed as competitors. It's a very odd message.